I know I know, another ‘best ever’ post but really, these are the best ever gingerbread cookies that I’ve come across. I’ve been making the recipe for years and it has never failed me. I also find it irresistible and so usually only make it for gifts. 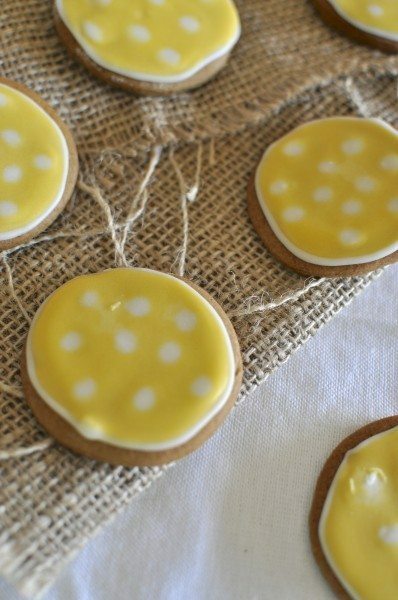 On this particular occasion, I made some yellow and grey spotted gingerbread to give as little thank you gifts to all by baby shower guests. I love that the dough can be made in advance and frozen until you’re ready to bake it. Just divide it in half, flatten into a disc, wrap in plastic wrap then pop it in a bag. To me, it seems like much less effort when you can just pull the dough from the freezer, defrost, bake and decorate. I made at least 3 batches over Christmas last year. The dough is nice and gingery with the essential richness from the golden syrup and brown sugar. You can bake them soft or firm and I’ve used the recipe to make a gingerbread house too (just bake it a little longer). These are my little gifts all packaged up. I thought the icing was totally dry when I put them in the container ready to be packaged up the next day. I thought wrong. The grey, sadly, wasn’t all that grey. My black gel colour made a lovely shade of grey but as the icing dried, it turned a shade of purple with ugly black specs through it. I was not overly impressed. At least the yellow ones turned out as I hoped. Excuse my unsteady circle-drawing hand. To make the icing nice and smooth with the dots, I first piped a thick white border of icing and let it set. 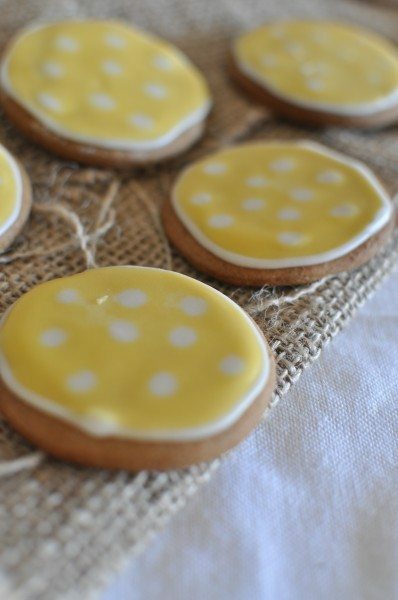 Then I filled them with a thinner yellow and while the icing was still wet, dotted spots of white into the yellow then left them to set again. I have to say I was a little bit sad when I counted them and realised I only just had enough for two for each guest. There were none left for the mumma-to-be. Not that it mattered, I ate my fair share of sweets at the baby shower as you might remember. What about you? Are you a gingerbread fan? 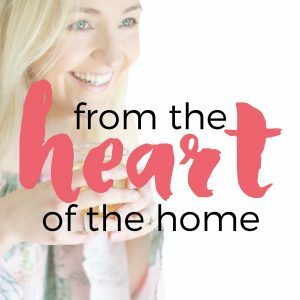 Do you have a favourite recipe or do you like to try a new one each time (I hope so!)? Combine butter, golden syrup and brown sugar in a small pan and heat, stirring, over low heat, until melted. Remove to a bowl and cool (I usually put the bowl in an ice bath for a ltitle while because I’m impatient!). Stir in the egg yolk and remaining dry ingredients to form a soft dough. Divide the dough in half and shape each half into a flat disc, wrap in plastic wrap and refrigerate for at least an hour to firm up. Preheat the oven to 160C (350F) fan-forced and line two baking trays with baking paper. Take one portion of dough out of the fridge and on a lightly-floured surface, roll it out to 7-8mm. Use floured, round cookie cutters to cut rounds of dough. Place on a baking paper-lined tray and bake for 7-10 minutes or until firm (they do firm a little more when they're cooling though so not too firm). Leave them to rest on the trays for 5 minutes then remove to a wire rack to cool completely. To make the icing, whisks the egg white to almost firm peaks. Slowly whisk in the icing sugar. To decorate as I have, pipe a thick round of white around the outside of each biscuit then leave it to set. 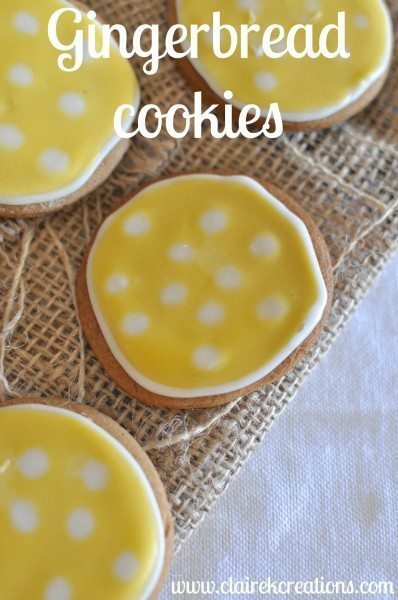 Thin a portion of icing and colour it then fill each cookie with the colour. Pipe spots of white on each one while the colour is still wet then leave them for several hours to dry. Ooh yes I do love molasses in biscuits too. The one I used was Wilton. Will have to have a look for AmeriColour. These are adorable Claire. 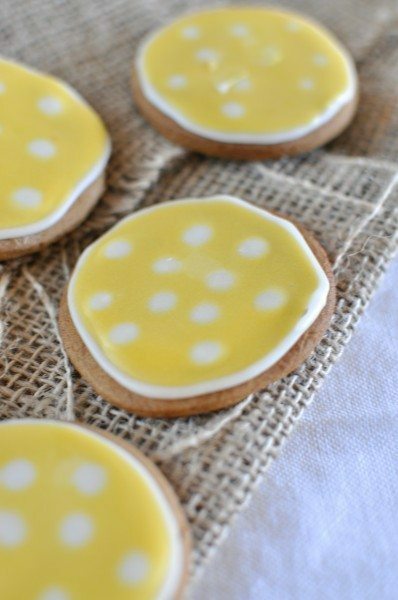 I usually like my ginger cookies with crinkles and crackles but I think yellow and white polka dots could win me over! 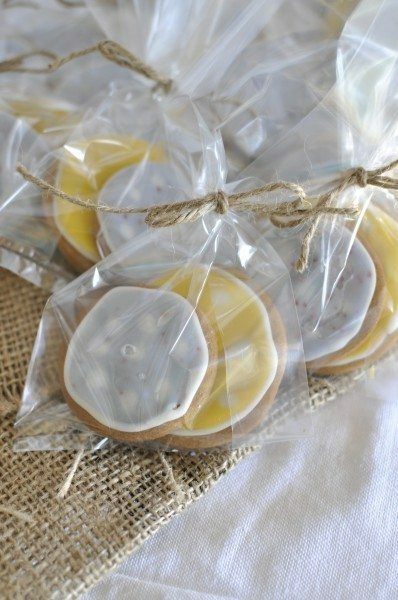 I just adore ginger bread cookies. I would have eaten all of them. I was very tempted Tania! I’m a gingerbread fan! These are really cute, Claire. Only 25 days to go? Really? Look how far you’ve come! 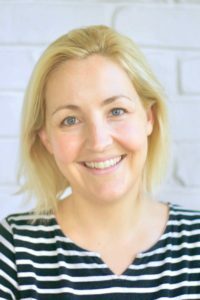 If you’ve been honest, you’ve had a sweetheart pregnancy and I hope the birth goes the same way. It has been pretty good Maureen I must admit. I hope so too! Oh that’s just like my gingerbread recipe, the only difference is the flour and you’ve got an extra teaspoon of mixed spice. The method is different though-I’d be interested to see the difference as you cook yours! How interesting. I’ll have to look at yours and see what the difference is. I admit when I first tried it I thought it was a little tedious but it’s worth it. I love the extra spice!